Davao City is one of the largest cities in the world in terms of land size. It is in the Southern Philippines and is a booming city - thanks to its progressive economic policies and peaceful environment. Davao is voted as one of the most investment friendly and livable cities in the region. Davao prides itself on its white sandy beaches, exotic fruits like Durian, the famous Waling-Waling orchid flower and the great Philippine eagle. Travellers are bound to enjoy in this city which is a melting-pot of cultures with people coming in not just from within the country but also from various countries of the world. Marco Polo Davao is in the heart of Davao's bustling business and commercial district, and is a mere 20 minutes' drive from Davao International Airport. Davao is accessible in one and a half hours by plane from Manila. The Philippine Eagle center is home to 36 Philippine Eagles, 18 of which are captive-bred. Simulating a tropical rainforest environment, the Center offers the visitors a glimpse in the country’s forest ecosystem. Eden Nature Park is a mountain resort 3,000 feet above sea level. It is home to vast gardens of herbs and organic vegetables, acres of lofty pines and fruit trees and showcases of exotic creatures. 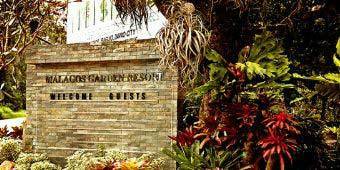 This beautiful garden houses a wonderful collection of Davao’s famed orchids, plus a butterfly sanctuary, adventure playground,bird park and restaurant. See cloth woven in intricate and colorful patterns from the fibers of the native abaca plant by the women of the Bola tribe. Enjoy the white sands and clear sea on this attractive island. Scuba diving and snorkeling are popular past times. The Davao Museum Foundation, Inc. is a non-profit organization that runs and maintains the Davao Museum of History and Ethnography. In many ways, it seeks to improve people’s understanding and appreciation of Davao and Mindanao’s history and culture. Across the street of the hotel is the city’s tourist favorite with its wide collection of exotic fabrics, antiques and trinkets, reminiscent of Davao’s rich indigenous culture.